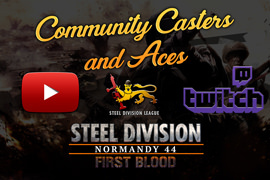 It's time for the last community-driven article featuring 3 casters and 2 top players of the League! We hope that you enjoyed reading this series of articles, on our side, we really appreciated the interaction with the persons involved and all the knowledge that was shared. In 1 hour from now, Rangroo and KhanUlric are casting 2 games of the American League, watch it on the official Paradox Twitch account! I saw it and it is amazing but moreover that I like the video you have mentioned over here.